and turned the green woods white. and sparkles in the light. Little Christmas Tree is a very sturdy board book with lots of flaps to lift. It's all about nature and shows the countryside surrounding a fir tree in winter and the animals, birds and insects that live there. 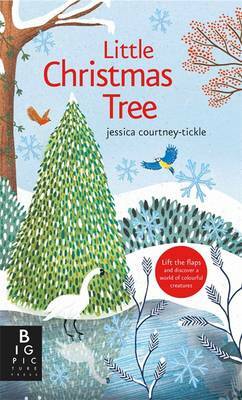 It's not really a story but the rhyming text describes what happens near the Christmas tree from the start to the end of Christmas day. The lovely illustrations have silver foil details and provide plenty to talk about, and there are several flaps to lift on every spread. Some of them are so well matched to the pictures that I only found them by touch, rather than by sight. The book is well made, the pictures are charming and there are flaps to lift. What's not to like?! I always love informational post which helps us to increase our competencies. Here determined new post which is high-quality for me. Really i don't make comment on every blog post. However this is something particularly intriguing and make me to learn typically. I've bookmarked this page for future reference.The entire fine, professional resume writing service writing aid for those who seek aid from them.